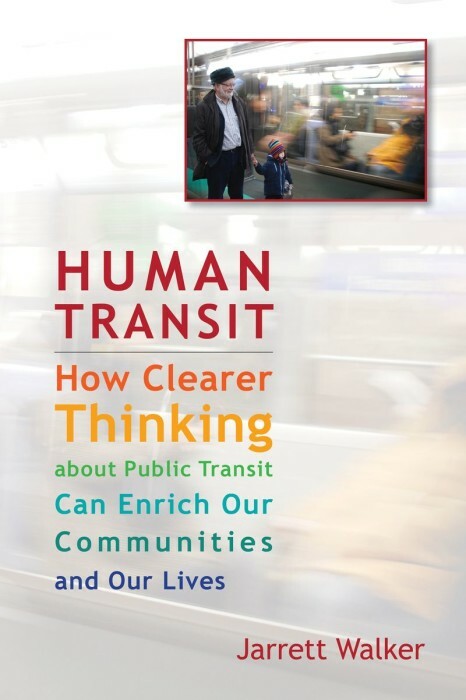 Below is the complete introduction of my book Human Transit: How clearer thinking about public transit can enrich our communities and our lives. You can also view the Table of Contents online. For more information or to order, see Island Press or Amazon, or contact your favorite bookstore. In Australia/New Zealand, you can get a discount by ordering direct from the Australian distributor, NewSouth. Suddenly, public transit is a critical issue. For decades, the private car has seemed the ideal tool for free and spontaneous travel, and in rural areas and many small towns, that will continue to be true. But all over the world, people are moving into cities, and great cities just don’t have room for everyone’s car. Meanwhile, the converging threats of climate change and the end of cheap oil are forcing a new assessment of how cities work. Public transit–the most efficient mode for moving large numbers of people long distances across cities–is an essential tool in that effort. Today, even Los Angeles and Houston, world famous for their extreme dependence on cars, are scrambling to grow their transit systems as fast as they can manage. The frustrations of urban transportation have fed a growing public interest in public transit in many countries. But when well-intentioned people look at the public transit around them, many conclude that it doesn’t make sense for them to use it. There are many logical reasons not to use transit. It may not go where you need it to go, or at the time you need to go. Perhaps you can get there three times faster by driving, or at half the cost. You may know from experience that you can’t trust your service to come on time. Your transit agency’s vehicles and staff may fail to meet the most basic standards for civility, safety, and comfort. Your transit network may be too confusing, requiring you to wade through too much detail to figure out whether the service is useful to you. These common frustrations explain why, in many urban regions, support for public transit is wide but shallow. Voters typically support transit in general, but most don’t know how to decide whether a transit proposal is good or bad. They may want better transit for themselves or their communities but have no idea how to make it happen. What is quality public transit? Who can realistically expect to be served by it? What kinds of quality matter? How do we recognize and nurture it? What are the goals we want it to achieve, and how do we navigate tough spots where these goals conflict? Debates about transit proposals commonly lose track of these questions. Too often, we defer to a small group of intensely interested people (such as developers, neighborhood groups, architects, labor unions, and purveyors of transit technology) because the debate seems too technical for most of us to follow. As a result, we sometimes end up with transit investments that don’t really do what we expected or that have bad side effects that should have been foreseen. Transit debates also suffer from the fact that today, in most of our cities, most of our decision makers are motorists. No matter how much you support transit, driving a car every day can shape your thinking in powerful subconscious ways. For example, in most debates about proposed rapid transit lines, the speed of the proposed service gets more political attention than how frequently it runs, even though frequency, which determines waiting time, often matters more than vehicle speed in determining the total time a transit trip will require. Your commuter train system will advertise that it can whisk you into the city in thirty-nine minutes, but if the train comes only once every two hours and you’ve just missed one, your travel time will be two hours and thirty-nine minutes, so it may be faster to drive or even walk. I can explain the concept of frequency to a motorist, and she may even understand, intellectually, why it’s important. But what she knows is the experience of driving, where speed matters and frequency doesn’t. So when she makes a decision about a transit project, she is likely to give frequency too little weight. The result can be services that are very fast but don’t come when we need them, or that require too much time to connect from one service to another. The unconscious assumptions of motorists are just one example of how people try to think about transit as though it were something else. Everyone tries to translate a question into terms that they understand. Economists may talk about transit in terms of profitability, as though that were its goal. Social service advocates think of it as a tool for meeting the needs of the disadvantaged. Architects and urban designers care about how it feels to move through a city, so they often focus on the aesthetics of the transit vehicle and infrastructure. Urban redevelopment advocates categorize services according to how well they stimulate development. None of these perspectives is wrong; transit can serve all of these interests and more. But to achieve that broad level of service, these points of view have to be brought together into a clearer conversation. To aid that conversation, this book aims to give you a grasp of how transit works as an urban mobility tool and how it fits into the larger challenge of urban transportation. This is not a course designed to make you a qualified transit planner, though some professionals will benefit from it. My goal is simply to give you the confidence to form and advocate clear opinions about what kind of transit you want and how that can help create the kind of city you want. Who Is the Public? Who Is an Expert? When our elected leaders make decisions about transit, they face a noisy mix of competing interests. A senior citizen has trouble walking to a bus stop, so she wants the stops placed closer together. Others want the bus stops farther apart, so that the buses run faster. A merchant wants the bus to deviate into his shopping center, to bring customers. Another merchant wants the bus out of his shopping center, because it’s bringing “undesirable” people. Suburb A wants a proposed rail transit line to go underground through their community, to preserve their ambience. Farther out on the proposed line, Suburb B wants the whole line elevated, so that the line is cheap enough to get all the way to Suburb B in its first phase. Transit professionals are not always in a position to clarify the debate. Some of them lack a sufficient understanding of their product or have been trained to think only about one aspect of it. Many more have the understanding but lack the confidence. Even worse, professionals who work inside transit agencies often find their time consumed by daily crises and controversies and simply don’t have time to take a wider view. For a variety of reasons, transit planning has not evolved as a credentialed discipline–like law, engineering, or architecture–where everyone has to pass a particular course of studies before they can be licensed to work. Transit agencies often value “real-world” experience more than education, but there’s no agreement in the industry about which world is real or which experience is useful. In my work as a transit planner, I have met many managers of transit planning who had been hired directly from other fields, with expertise in planning perhaps, but not in transit. I have met bus drivers who had been transformed into managers, knowing nothing of the craft of management. Some of these people learn fast, adapt, and thrive, but others feel defensive and turn into obstacles. The openness of the transit planning field–the ease which it can be entered from related areas–has many advantages. The last thing we need is another closed and revered priesthood enforcing a uniform dogma, like the generation of highway engineers who designed America’s interstate system. The principles of transit planning are simple enough that nobody needs a graduate degree to understand them. Anyone who is willing to keep learning should be welcomed into the transit professions. On the other hand, there really are some facts about how transit works, and they are not all intuitively obvious. In fact, some of them may seem intuitively wrong until you stop to think about them. Most of these facts arise from math, geometry, and occasionally physics, so they’re true everywhere, of every technology and every culture. If you’re going to form intelligent opinions about transit, so that you advocate projects that actually serve your goals, you’ll need to understand these basics. These underlying facts of transit force us to make hard decisions, but they also open up possibilities. My aim is to help you see the unavoidable hard choices and to form your own view on them but also to help you feel optimistic about the range of things transit can do and how a smart use of transit can improve your community. Like any box of tools, transit can do a lot of useful things, but only if you know each tool’s purpose. Much of the noisy confusion in transit debates is the sound of people using a hammer to turn a screw, or a screwdriver to pound nails. A core idea of this book is that we will have clearer conversations, and make better decisions, if we distinguish carefully between values and expertise and understand their interplay in our transit debates. What is transit’s purpose? How should we measure the results of our transit system? Ridership? Emissions? Complaints? What counts as adequate and useful transportation? What, for example, is the minimum level of quality that transit should be aiming for? What kind of city do you want? Transit, like all transportation infrastructure, can have big impacts on the form, feel, and functioning of your city, so it’s important to understand those impacts in advance. Experts like me can clarify these questions but shouldn’t be answering them for you. My job in this book is not to make you share my values but to give you the tools to clarify and advocate yours. You, and your community, get to choose “what” you want and “why.” An expert’s job is to help with “how.” It’s a crucial distinction, one that often gets lost in transit debates. The plumber’s question reveals that values (“what”) and expertise (“how”) have to interact more than once. A transit planner working for your community is like a plumber: he’s there to implement your values, not his. But you can’t just tell the expert what you want and leave the room, and when a leader or manager does this (“Just do it this way–I don’t care how you do it!”), he’s likely to be unhappy with the results. The values and the expertise must engage in a conversation. Fortunately, as with plumbing, the questions that transit experts will have about your values are predictable. The same kinds of questions come up over and over. For this reason, the best way to form a resilient and credible opinion about transit is to think carefully about these typical “plumber’s questions” and to discuss them within your community. This book is designed to help you do that. These questions arise, unavoidably, from the underlying geometry of transit. This book explores each question in detail. Many people are trying to make transit do things that are geometrically impossible, so it’s important to start by exploring how transit works in these terms before going on to the question of technology. When someone asks me what I do, and I say I’m a transit planner, their next question is almost always about technology. They ask my opinion about a rail transit proposal that’s currently in the news, or ask me what I think about light rail, or monorails, or jitneys. They assume, like many journalists, that the choice of technology is the most important transit planning decision. Technology choices do matter, but the fundamental geometry of transit is exactly the same for buses, trains, and ferries. If you jump too quickly to the technology choice question but get the geometry wrong, you’ll end up with a useless service no matter how attractive its technology is. What’s more, the most basic features that determine whether transit can serve us well are not technology distinctions. Speed and reliability, for example, are mostly about what can get in the way of a transit service. Both buses and rail vehicles, for example, can be fast and reliable if they have an exclusive lane or track. Both can also be slow and unreliable if you put them in a congested lane with other traffic. Technology choice, by itself, rarely guarantees a successful service, and many of the most crucial choices are not about technology at all. Many of the “plumber’s questions” about transit will be easier or harder because of the way your city is laid out. The physical design of cities determines transit outcomes far more than transit planning does. Your particular location in the city, and the nature of the development and street patterns, will govern the quality of transit you can expect. For that reason, one of the most urgent needs related to transit is to help people make smarter decisions about where to locate their homes and businesses, depending on the level of transit mobility that matters to them. These decisions, aggregated across the whole population and over many years, can change the shape of your city for better or for worse. Ultimately, our cities grow and change due to individual decisions about where to locate things. It may seem that the developers, planners, and politicians are making these decisions, but all citizens are part of the market that they serve. So everyone contributes to determining whether transit can work in a particular city or development. Chapter 14 is about how to make those choices more wisely. Since 1990, I have been a consultant specializing in transit service design–that is, designing transit networks and their schedules to provide the best possible service to a community, according to the values each community expresses. I’ve also worked as an in-house consultant in major transit agencies, serving temporarily as part of their staffs. In many cities, from small towns to large urban areas, I can point to places where my service designs are working on the street and have made a clear difference in the relevance of transit. The core pleasure of my professional life is to see transit working well in the real world. Since I was ten years old and began riding the city buses across Portland, Oregon, to school, I have been an attentive customer of transit, constantly musing about how this or that could work better. Phoning the planners at Portland’s transit agency, TriMet, I found them interested in talking with me and receptive to new ideas, so I never learned the debilitating cynicism that so many citizens feel–the sense that their transit agencies are so stuck in their ways that there’s no point in providing input. Though I sometimes criticize them, I am proud of Portland’s city and regional governments and of TriMet. I like to think I have had very small roles in making Portland a better place. Finally, I spent my twenties doing a PhD in a literature field, so I’m extremely sensitive to the workings of language. Throughout the book, I’ll point out situations where word choices matter and where the structure of our language may be preventing us from thinking clearly. But enough about me. Who are you? In writing this book, I imagine that you, the reader, are a curious and thoughtful person who cares about whether we find our way to more rational forms of urban mobility. Perhaps you work or study in a field related to transit, such as land use planning, traffic engineering, or real estate development. You may be a community or business leader, a journalist, or a committed activist. Perhaps you have come to transit issues from another concern, such as the economic development of your city, or the rights of the disabled, or the well-being of seniors, or some form of environmentalism. Perhaps you have used and admired the transit systems of other cities and wonder why those systems aren’t possible where you live. Perhaps you are simply a citizen who doesn’t like what is happening to your city, who is not sure how to evaluate the transit planning disputes flaring around you, and who wants to hold more confident opinions. This book is for you if you come to the question of transit with clear ideas about what you want for your city and curiosity about how transit could help you achieve that. The core ideas of this book apply anywhere in the world, but my examples focus on the United States, Canada, Australia, and New Zealand. These countries share not just affluence by world standards but an important feeling of spaciousness that comes from having a lot of land and only a few centuries of urban history. For that reason, these countries have led the world in building low-density, car-dependent cities–the hardest and most interesting challenge for public transit. Still, readers in other developed countries will find most of the book useful as well. As for the less affluent or “developing” world, the geometry is the same but one crucial aspect is different. The cost of running transit in wealthy countries is usually dominated by the cost of labor–drivers, mechanics, and so on. In the developing world, labor is much cheaper, and fewer people own cars, so transit is cheaper to operate and has a larger customer base. That means transit is often a profitable small business–as small as one driver and his bus–so transit is usually abundant but poorly organized. Cheaper labor also means that smaller vehicles are economical, so developing world cities tend to have a diverse range of minibuses, shared taxis, and the like. But although transit’s costs and markets differ in the developing world, the limitations of urban space do apply. Often, the abundance of minibuses and shared taxis is enough to create near gridlock even without many private cars. Today, the developing world is the site of frenetic development of modern bus systems, bus rapid transit, and sometimes rail transit. As these countries grow more prosperous, they face many of the same issues that we in the wealthier countries face now, so I hope readers in the developing world will find the book useful as well. Who Are “We”? Who Decides? Throughout this book, I use “we” to mean you and your fellow citizens in a democratically governed city, along with me as your hired transit planning expert. I assume, in short, that as a citizen, you’re someone whose opinion matters and that if you get together with your fellow citizens and think together with the benefit of an expert’s advice, you can arrive at your own resilient view of what you want transit to do–and thus of what kind of transit you need. If you’ve spent any time following transit politics in a big urban area, this notion may seem naive. Perhaps you’ve dealt with cities where a tangle of government agencies works on transit, often quarrelling more than they cooperate. Perhaps you’ve dealt with bureaucracies that seem defensive, trapped by their own fears and habits, and unwilling to engage you in respectful conversation. Perhaps, too, you suspect that a small, self-interested elite really makes all the decisions that matter, and that public consultation is just a show. If so, you’re probably wrong about that. In twenty years in this business, I’ve seen plenty of frustrating, confused, and hijacked decision processes. If I wanted to be bitter and cynical, I would have the experience to justify it. But I’ve seen another pattern: the involvement of more informed and caring citizens–expressing themselves with courtesy, clarity, and persistence–almost always leads to better outcomes. In any debate, there will be people at the decision table who care only about their personal interests and needs. If those people have the decision table to themselves, you’ll get decisions that serve those interests but may not serve your city. But in situations where lots of citizens care, and choose to learn a bit about transit so that they can advocate more clearly and confidently, better decisions get made, decisions that lead to better mobility, a stronger economy, a more just society, or whatever goal the community is pursuing. Political leaders make good decisions when informed and caring citizens want them to. It’s only when they sense that citizens have given up or don’t care that they let narrower interests carry the day. I see this pattern over and over. So if you’re willing to learn a bit about how transit works, what it does well, what it doesn’t do, and how it fits into the larger challenge of the city, your opinion counts. Throughout this book, you’ll be asked to develop a respect for transit not just as a tool but also as an area of expertise. As a transit planner, I find that many people look at transit lines running back and forth in their city and feel that it looks easy. Many other people think they understand transit because they understand something that’s connected to it, such as urban design, operations management, economics, or traffic engineering. Get all those people in a room and they start arguing and talking past one another, often hurling jargon as a weapon. Other citizens listen to a bit of this and decide that transit is impossible to figure out. It’s actually not hard to understand transit and how it can serve our values and needs, if we approach it with some respect. Let’s try. This permanent page is closed to comments, but you are welcome to comment here, or hit the email button under my photo.